All European mopeds, and Asian mopeds with European engines, have 1/2″ x 3/16″ chains. In modern chain numbers, they have 415 or 415H type motor chains. Most mopeds use a 415H with taller and wider plates. Some (with a lip close to the sprocket teeth) must have a 415 with shorter and thinner plates. How to install and remove master links. To order a regular replacement chain for your moped, count the links (L) in your old chain. Tomos is around 90L -94L, Puch is around 100L, others are 102L to 106L . It’s always an even number because roller chain links come in pairs, inner and outer. Some chains have a “half link” that’s half inner and half outer. Then the link count will be an odd number. 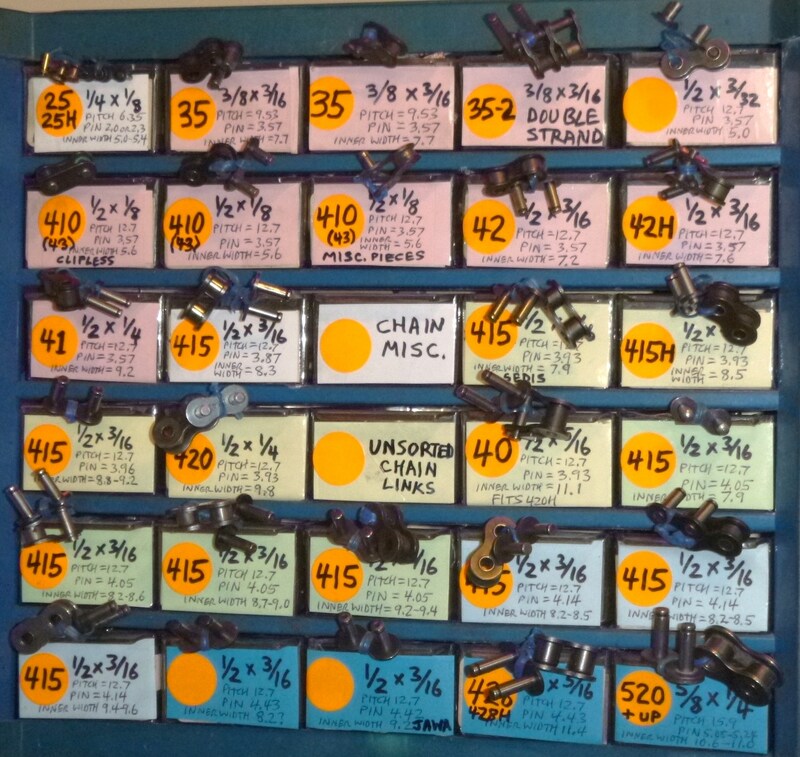 Myrons Mopeds will cut the new chain to have the number (must be even) of links that you say, for no extra charge. If your chain is a 415H, and you need an odd number of links, a 415H half link is available for $3 extra. E. The only vintage chain that says 415. Wow! 340360 A chain RK 415H 3.93 x 8.0 black 110L $20 <<<< very good chain! At left is Myrons Mopeds master link cabinet, full of master links and half links from 20 other moped shops that closed in the late 1980’s in Southern California. Each of the drawers contains about 10 to 100 links. Each link was measured carefully and/or put through this gauntlet of Go/NoGo gauges, which are the actual master links and corresponding inner links contained in each drawer. From left to right, the order is smallest pitch first, smallest pin first (for that pitch), and the smallest inner width first (for that pitch and pin). Inner width for a master link is the space between the inside of the outer plates, which is slightly greater than the inner width for the chain, as in the chart below. Notice that there are no “international” master links, like 04B (6mm) or 05B (8mm). These chains did not appear in California until the late 1990’s with the stand-up scooters, pocket bikes, and electric bikes and scooters, mostly from China. Chains for mopeds, motorized bicycles, gas or electric scooters, and minibikes are not on most application charts. For these oddball vehicles you have to measure and determine which chain size it takes, and how many links. Some Chinese made scooters and pocket bikes have 6.00mm pitch (not 6.35 = 1/4″) or 8.00mm pitch (not 9.53 = 3/8″). They look the same but don’t mesh on American sprockets. Another main source of confusion is pin diameter. Often several different chains interchange (fit the same sprocket), but have different pin diameters, pin lengths, and plate thicknesses. So while the entire chain interchanges, the individual links do not. A master link from one 415 chain often does not fit another 415 chain. Wow. 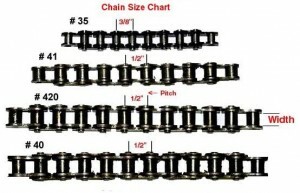 The dimensions of “every” roller chain, that might be used on motorcycles, scooters or bicycles, are listed below. The first three dimensions, pitch P (distance between pin centers), width W (distance between inside of inner plates), and the roller diameter D, are what matter for it to fit the sprocket. A wider chain (larger W) will work but not as good. European moped chains are #415 compatible. Asian moped chains are #420. 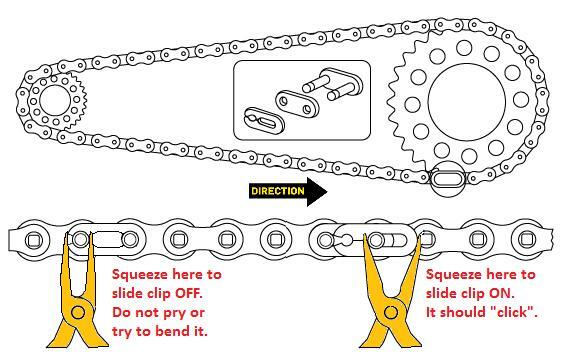 Single speed bicycle chains are #410. Electric and small gas scooters are #25 (American) or #04B (International). Gas scooters and pocket bikes are #35 (American) or #06B (International). American made mini bikes are #35 or #41. American power equipment and industrial chains are #25, #35, #41, #40, #50, #60, and up. Modern motorcycle chains are #420, #428, #520, #525, #530, and #630. Small engine timing (cam) chains are #25 (American), or #04B (International). Scan up and down the chart looking for similarities. Notice how the pitch P, and roller width W, and roller diameter D, can be the same for many different chains. Too bad the pin diameter A can vary with the maker. Ouch. A pin too big won’t fit. A pin too small will fit, but will be loose. The only way to get the correct master link is by knowing the pitch P, roller width W, roller diameter D, inner width W+2*T, and pin diameter A. 3/8 x 1/4 9.53 6.35 obsolete ? Vintage Moped Chains: Vintage bikes often have obsolete chains, or they specify the size in an obsolete way. Vintage equipment used the inch size, pitch x width. Modern motorcycles all use chain model numbers, like 428, 520, 630. The above chart shows that connection. In mopeds, there are 18 different chains, all size 415, or 1/2 x 3/16. They have different pin diameters and inner widths. In modern mopeds there are about 3 or 4. Moped Chain History: When a shop installs a new chain, they throw the leftover pieces in a box. As the years go by, layers of chains accumulate, with the oldest ones at the bottom, as long as no one mixes up the pile. 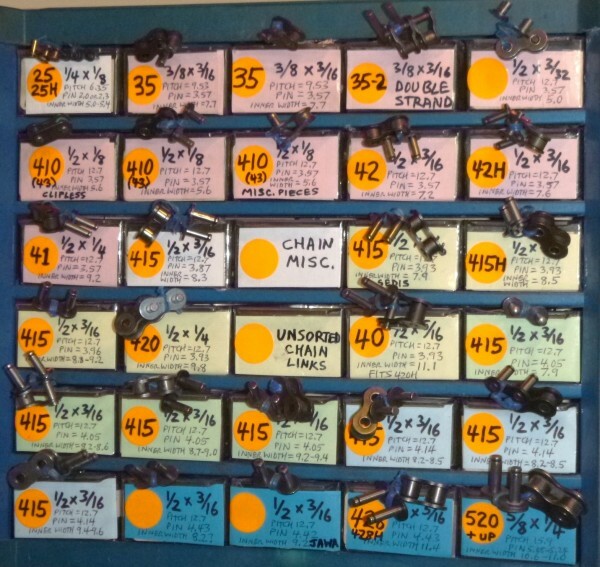 That’s one way to “date” chains. At Myrons, certain boxes of parts have been untouched since about 1985 to 1995. Only one little scrap of modern 415H chain was in that material, from those years. Not even 415H master links were in that time zone. This little scrap is what Shaun believes to be the earliest example of a 415H chain. Shown below on the Motobecane sprockets, it’s gold and says “Taiwan”. Taiwan bicycle products and machinery blossomed in the 1980’s. China made components came out about 15 years later. Italian Chain History: At least five different Regina chains are original on 1970’s and 80’s Italian made mopeds, two that say “Regina Extra” and three that say “Regina” underlined. See their pictures above. They all have different master links! Craziness! Tomos Chain History: At least seven different Tomos chains have been used over the years. Above, seven Tomos chains take three different master links. The pins range from 3.89 to 4.14mm thick. The inner width ranges from 7.9 to 9.6mm. “Inner width” means measured between the inside walls of the outer plates. A wider inner link will not fit inside a narrow outer link. Motobecane front sprockets with rubber rings. Left, the original IRIS chain, meshes correct. rides up too high and does not mesh. Motobecane front sprockets without rubbers. Left, the original IRIS still meshes good. Right, the 415H meshes good now. The end roller is cut away to see the fit. Peugeot 103: Sometimes the newer “H” rated chains do not fit until after the bike is rode for a few minutes. 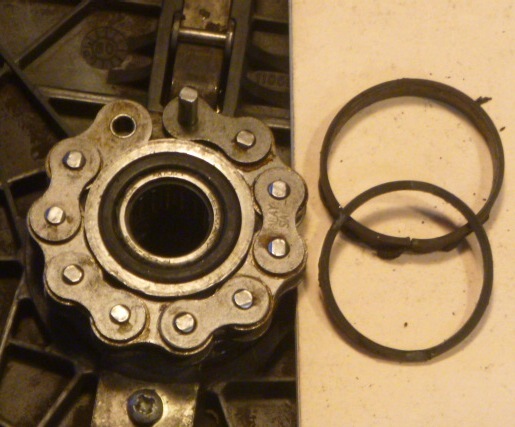 The two rubber rings on either side of the original sprocket interfere with the larger outer plates on the 415H chain, causing the chain to run higher and not mesh well. After riding awhile the chain noise gets less, as the rubbers get squished and interfere less. Still, it is better to remove the pulley, and remove the rubber rings, shown at right, to have a smooth running chain. Peugeot 102/103 front sprocket with original rubber rings. 415H chain does not mesh. Peugeot 102/103 front sprocket with rubber rings removed. 415H wraps around fully. Peugeot 102: This is the only US-model moped that uses a 42 chain, same sprocket as a 415 (1/2 x 3/16), but lighter duty (thinner pins, thinner and smaller plates). Sedis made both 415 chain for Peugeot 103, and 42 chain for the lighter weight Peugeot 102. Old Sedis chains are often cracked. Then they break/throw the chain. No fun. 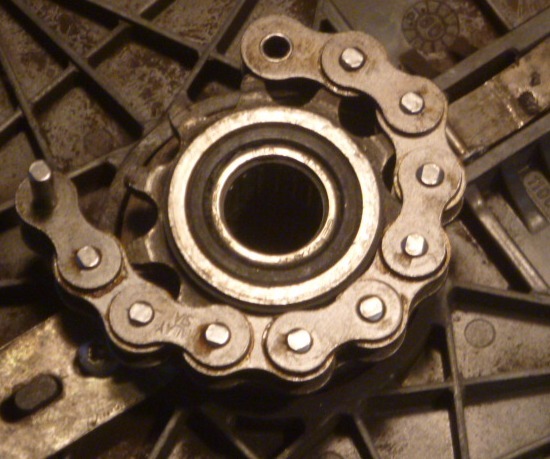 To use a modern 415H chain, the two rubber rings on either side of the sprocket must be removed, or it won’t mesh properly. See photos at right. Motorized Bicycles: 415 – Only Kind: Certain modern motorized bicycle gas engine kits use a 415 chain that passes very close to the engine case on both sides. These do not have enough room for the wider-on-the-outside 415H. They require a 415. Motorized Bicycles: 415 and 410 Mixed: Certain modern motorized bicycle gas engine kits have a wide engine sprocket for 3/16 and a thin rear sprocket for a 1/8 chain. A 415 or 415H chain works but would be expected to have less retention (it would come off easier). Motorized Bicycles: Long Chain Runs: Motorized bicycles with long chain runs need chain guides and/or chain tensioners, or else the chain comes off when it slaps going over bumps, or when the frame or wheel flexes, or when the engine mounts shift/slip. The kits don’t usually come with any. American Made Minibikes: There were many different manufacturers of minibikes back in the 60’s and 70’s but most of them used either a 35, 40, 0r 41 chain. Number 35 was used on most all 4-5-6 inch wheel minibikes while 41 was used on larger minicycles such as Rupp Roadster II and Speedway. Number 41 chain will not run on a number 40 sprocket. Number 40 chain will run on a number 41 sprocket but it will be wider than needed. Fun Karts and Minibikes: Many chains have the chain size stamped directly on the chain links. #35, 40, 41 and 420 chain are used in the Fun Kart and Mini Bike industry. An 11 or 12 tooth clutch sprocket usually indicates the use of #35 chain. 10 tooth clutch sprockets usually indicate the use of #40, 41 or 420 chain. You are currently browsing the archives for the Chains category.